If American farmers do not cool their non-lactating dairy cows, they stand to lose a collective $810 million a year, a significant blow to their financial well-being, a new University of Florida Institute of Food and Agricultural Sciences study shows. These cows, known to farmers and scientists as “dry cows,” do not produce milk because they’re in the last two months of their nine-month pregnancy. Farmers stop milking cows during those two months, and the cow responds by going dry – no longer producing milk. 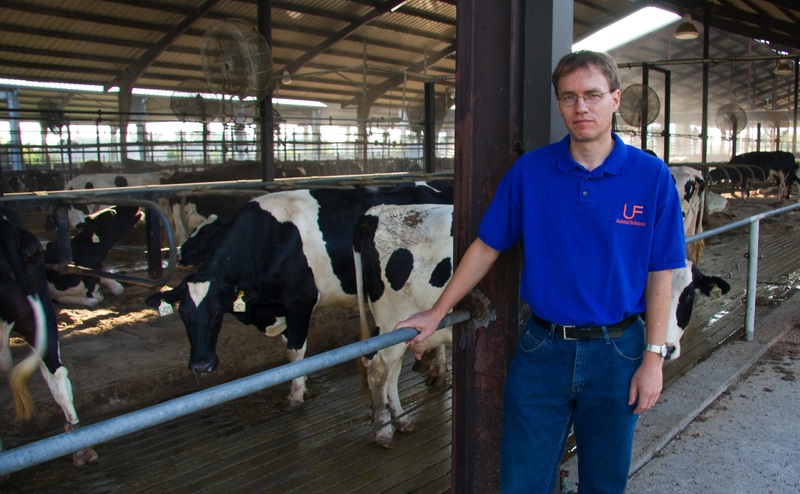 The cow needs the dry period to grow the last two months of the calf and get her mammary system and body ready to produce more milk again after the next calf is born, said UF/IFAS animal sciences associate professor Albert De Vries. Bear in mind, many farmers do keep their dry cows cool, De Vries said. Farmers cool their cows by frequently sprinkling water on the cow’s back and using fans to blow air on them. But De Vries and doctoral student Fernanda Ferreira wanted to find out the costs of not cooling dry cows. In the study, published in the Journal of Dairy Science, De Vries and Ferreira examined farm climate data in New York state, California and Wisconsin. They determined how many days per year a dry cow in each state would suffer from heat stress if it’s not kept cool regularly. From there, they calculated how many dry cows would suffer from heat stress in a year in the U.S. and multiplied that with the economic loss per dry cow as a result of suffering from heat stress in their dry periods. Thus, the $810 million loss would be the cost of lost opportunity or the economic cost of milk not produced if all 9.3 million American dairy cows were too hot when they were dry, De Vries said. Many dairy farmers do cool their dry cows; consequently, the real loss from not cooling dry cows is less than $810 million. Researchers do not know how much less. “But still, many farmers often ignore cooling dry cows, not realizing that dry cows under heat stress produce less milk later,” De Vries said.